Mike’s primary instrument is bass, but he was taught a bit of piano by his mother and aunt and also plays guitar. He started playing double bass in the Woodmont Elementary School Orchestra in 4th grade and picked up an electric bass while attending junior high at Peabody Demonstration School and West End Middle School. Mike also played double bass in the Nashville Youth Symphony during high school while attending Hillsboro High School and earned a scholarship to the Blair School of Music as well. While performing with Dr. Jones, Walter called Mike and asked if he’d be interested in playing with B.B. King. Mike recalls that he thought Walter was pulling his leg, but Walter was serious and asked if Mike could be in Indianapolis the next night. Mike was both excited and nervous and got himself together and flew to Indianapolis to meet B.B. King at the Beef and Board Dinner Theater. Both B.B. 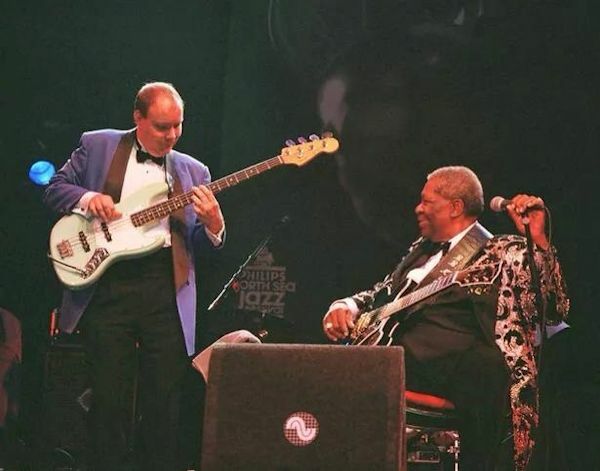 and his son Willie had seen Mike play bass on the Bobby Jones Gospel Show. Willie asked his dad, “What do you think of that new bass player?” B.B. replied, “Well, if he can play gospel, he ought to be able to play the blues”. Mike rode with B.B. and the band to Texas and finally two weeks later B.B. let him play at Rockefeller’s in Houston. Walter told Mike that if he could survive a bus ride with B.B. King’s band that he probably could make it. The next night in Dallas, B.B. asked him, “Do you want a job? I’ll give you a job if you want a job.” Mike thought he was dreaming. Always the professional, B.B. told Mike that if he ever let him go, he’d give him two-week’s notice and if Mike ever left, he asked Mike to also give him a two-week’s notice. Mike shook hands with B.B. and played with him for the next 17-years in his band. B.B. King sometimes played 300+ nights a years and stayed on the road quite a bit. Mike toured world-wide and performed on the Grammy winning albums, “Live at San Quentin” (MCA 1988), “Blues on the Bayou” (MCA 1998), "Makin’ Love is Good For You" (MCA 2000) and “A Christmas Celebration of Hope” (MCA 2001). He also performed with B.B. King on the television shows, “B.B. King and Friends” (HBO 1987), “The Cosby Show” (NBC 1990) and “Jazz Central” (BET 1999). Mike appeared with B.B. in the films “Next of Kin” (Lorimar 1989) and “Heart and Souls” (Universal 1993). Mike had to leave the band on account of health issues, but B.B. provided health insurance for his band and that saved Mike. He even kept Mike on retainer while he recovered and also helped him with tuition when he went back to Tennessee State University to finish his degree. “B.B. King was a humble, generous and loving person,” Mike recalls. Mike went on to perform on the WLAC-AM 1510 radio show “Legally Speaking”, which was broadcast over 32 states. He later met Tony Gerber from the Cotton Blossom Band through renowned music artist, Aashid Himmons, founder of the band Afrikan Dreamland. Tony was doing some spots on the Mando Blues Show with Radio Free Nashville and asked if Mike would like to play with them. Mike is on their album “Soulshining”. The Nashville Bridge honored “Soulshining” as one of the best releases of 2014 along with Justin Townes Earle, Ray Price, Ricky Skaggs and Jack White. Currently, you can catch Mike playing with Gil Gann at the B.B. King Blues Club on 2nd Avenue and Bourbon Street Blues & Boogie Bar in Printer’s Alley. Mike also plays with the TSU Wesley Foundation Community Big Band with fellow B.B. King Band member and trumpeter Stanley Abernathy (also a Donelson neighbor). Mike has lived in Donelson for 20 years and chose to call this home because it’s peaceful, family friendly and convenient to just about everywhere. I hope you enjoy this selection of amazing music from Mike’s incredible career!